The StaffCоunter local server is just like the global server, except that it is located in your office. It has all the same features as the cloud server when it comes to collecting and processing information from computers where the StaffCounter monitoring agent is installed. The local server is installed on a Linux virtual machine under the program VirtualBox. Install VirtualBox on a particular computer. Download and decompress the archive containing the server in a new folder. Inside the archive you’ll find an .ova file to import the configuration into Virtualbox. 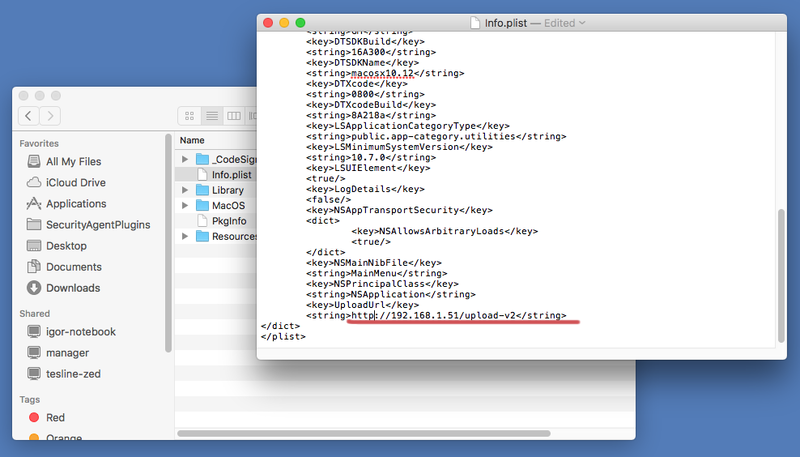 Import configuration…. Specify the path to the .ova file. The local server must be connected to the local network. Open the configuration for the virtual machine and go to Network settings. 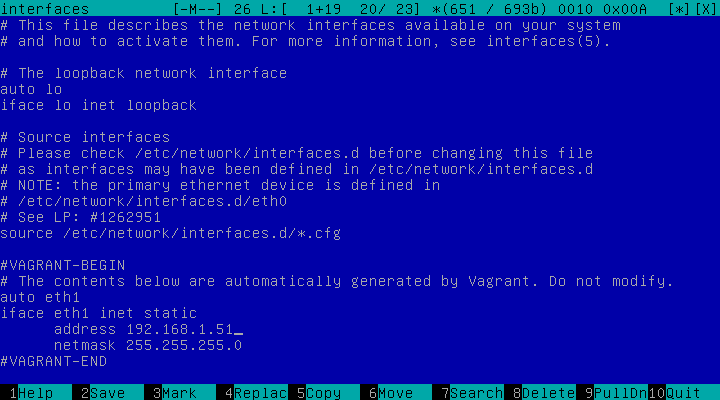 For adapter 2, point to what existing network card the program should connect to. Note: To fully turn the virtual machine off, execute the command sudo shutdown -h now instead. Enter the console, using the details from the Readme.txt file. 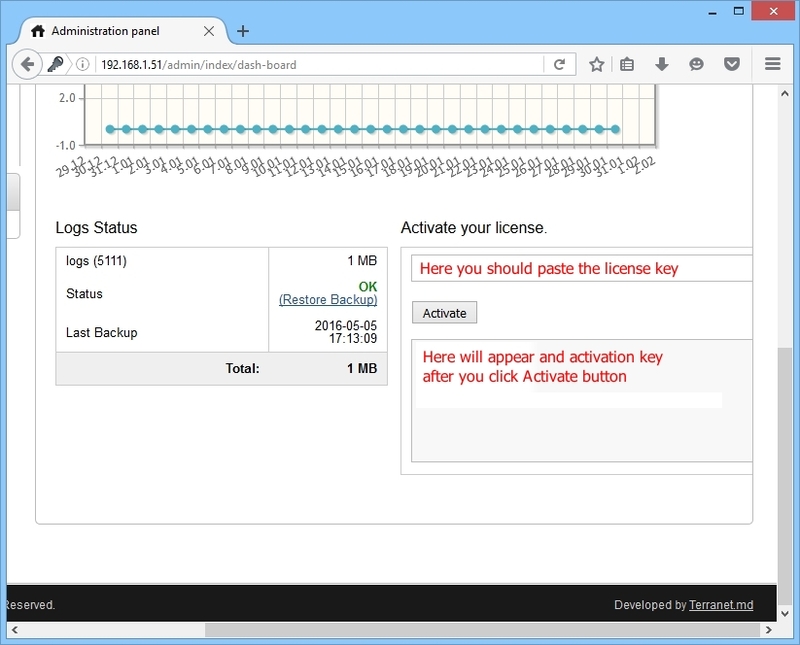 Enter the registration key that you received when purchasing the local server into the field Activate your license and then click Activate. The computer that you are using for this must be connected to the internet. 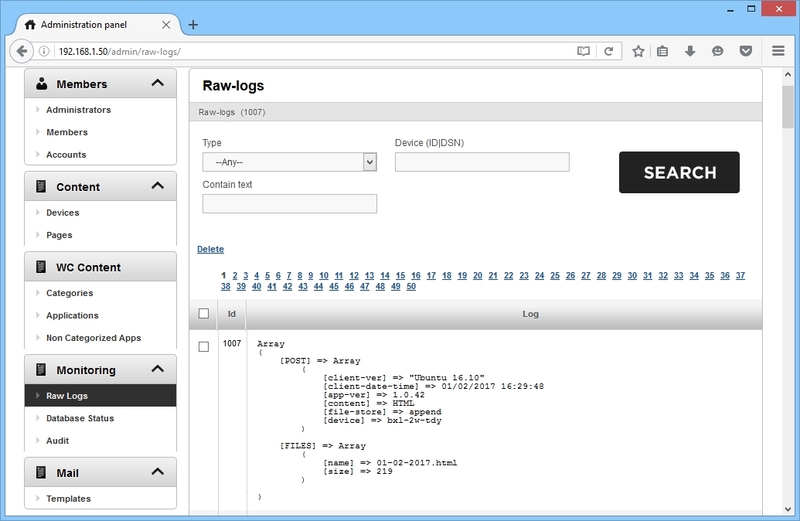 The monitoring agents for Windows, Mac OS and Linux can be downloaded here. Read carefully the instructions for each program before installing. 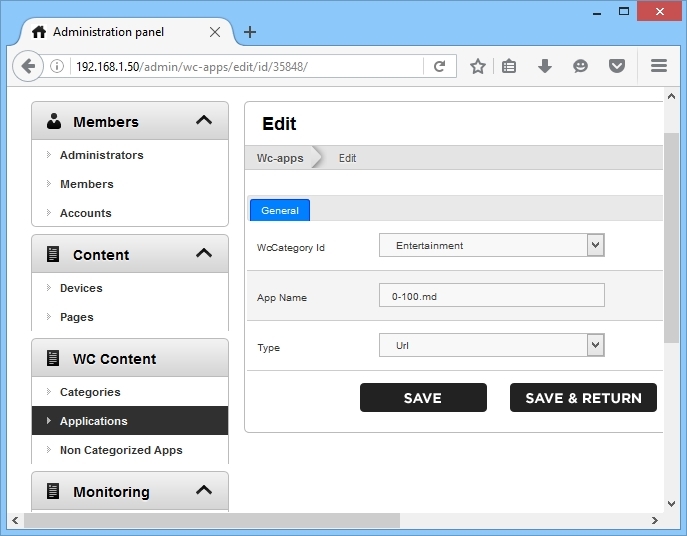 After installing the monitoring program, you must enter changes into the registry (on Windows) or the configuration file (on Mac OS and Linux). After this, launch install.bat as the administrator. After installing StaffCounter for Mac OS X, open the folder Applications, right-click on StaffCounter and choose “Show package contents”. In the file info.plist change the address of the server on the line UploadURL, then change https to http. 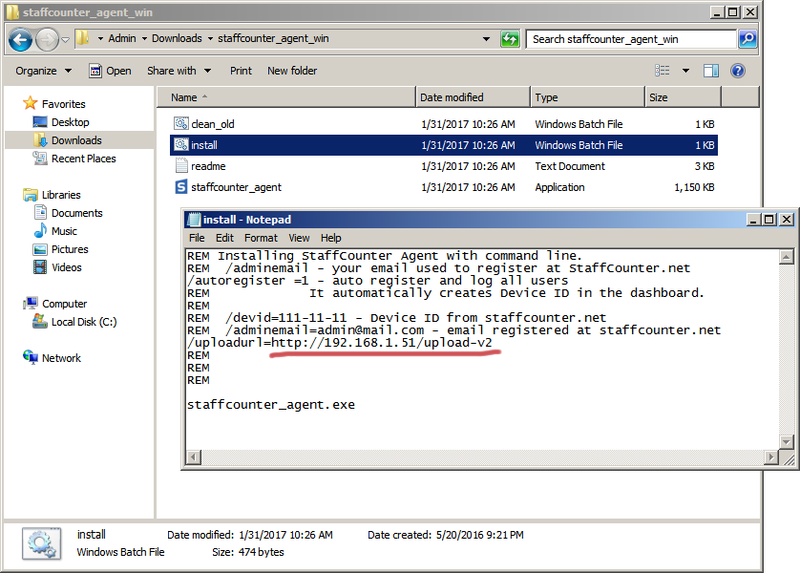 After editing the configuration file, you can copy StaffCounter from the Applications folder to a removable drive and launch it on all Apple computers in the office. Download and decompress the distributable. Edit the file /files/staffcounter.conf within the package. 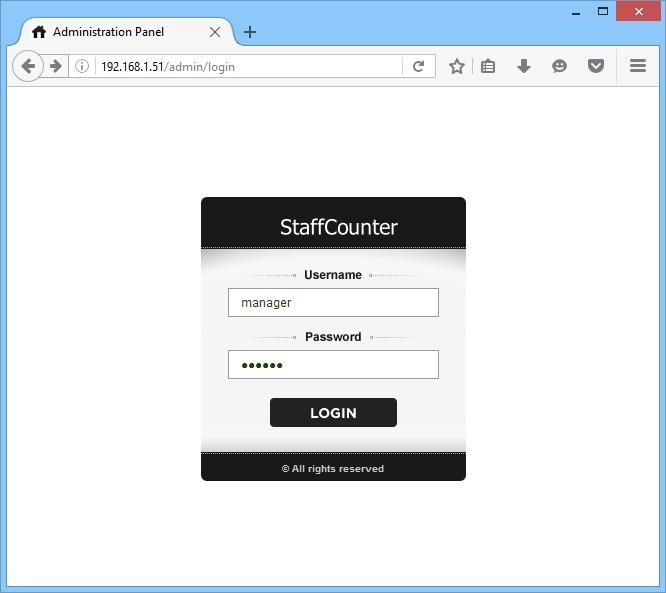 In the section network uncomment the line *url* and specify the local address of your StaffCounter server. In the file Readme.txt you will find the username and password for the administrator of the local server. 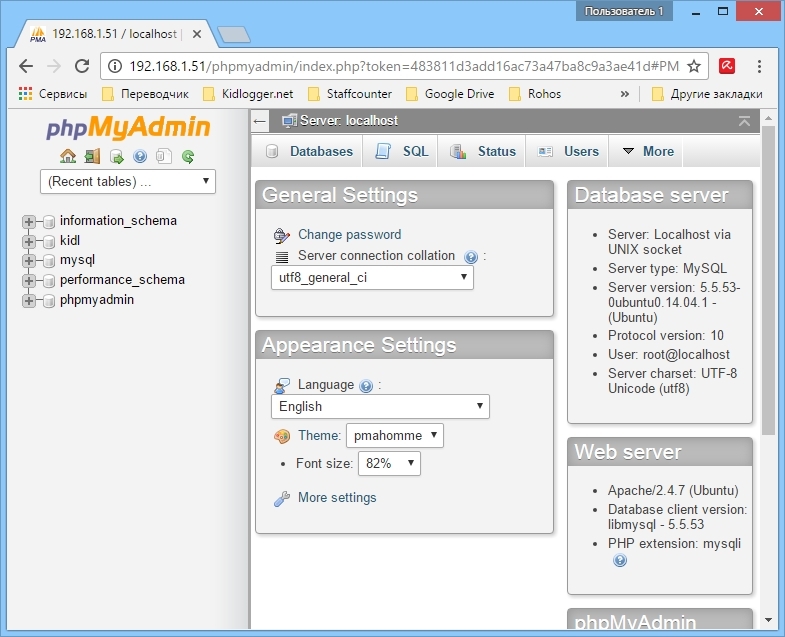 In the administrator panel you can add, edit, and remove user accounts on the local server. To do it, select the item Managers in the table on the left. By using the commands Add and Delete you can add or remove a manager, respectively. 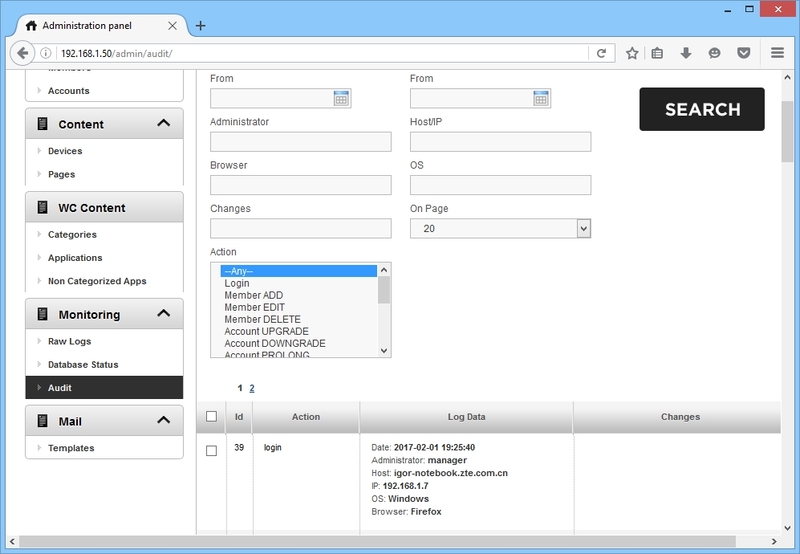 Using Edit you can make changes to an account, such as the e-mail address, password, name or role of the administrator. In the section Devices you can delete or edit settings for virtual devices where data is uploaded by the agent programs installed on employee computers. 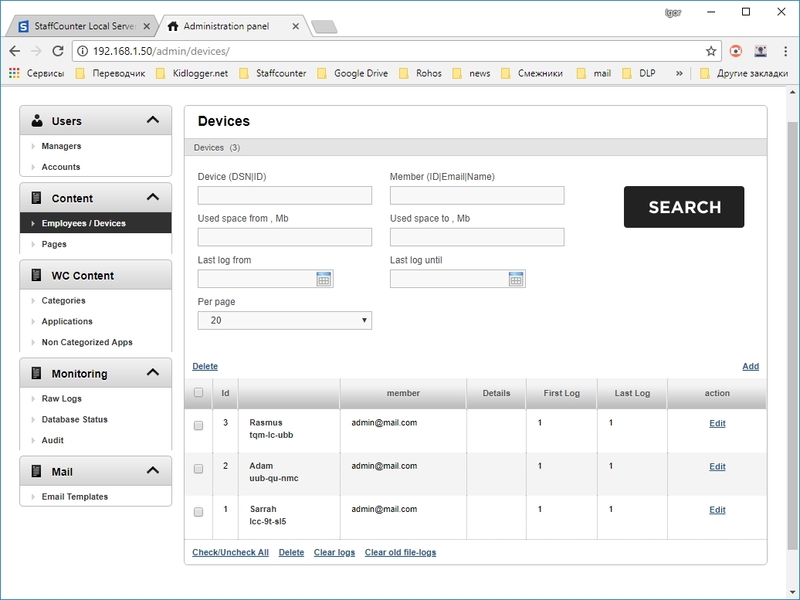 In this window you can easily find devices by the manager’s address, by the name of the device and its ID, and the place it occupies on the server. 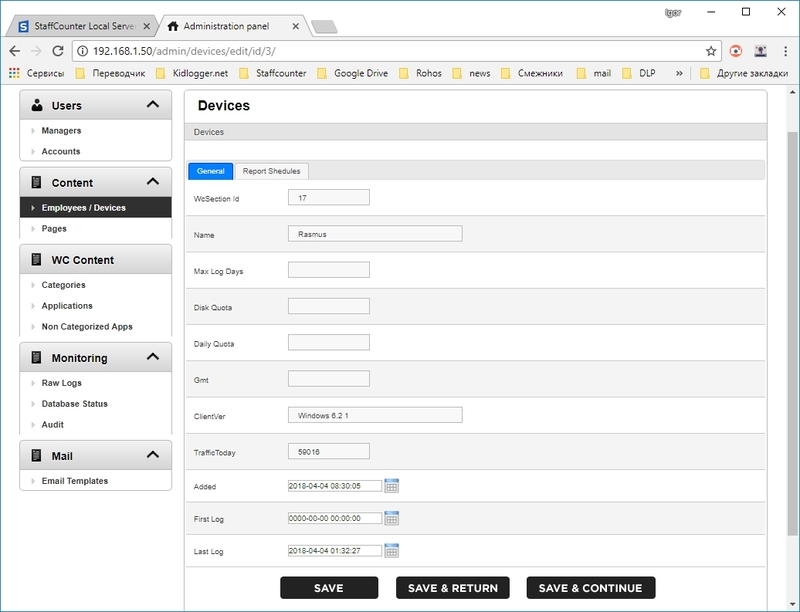 Using Edit you can view and change settings for the given virtual device: the maximum amount of data saved on the server, the amount of time for which data is saved, as well as the device type. 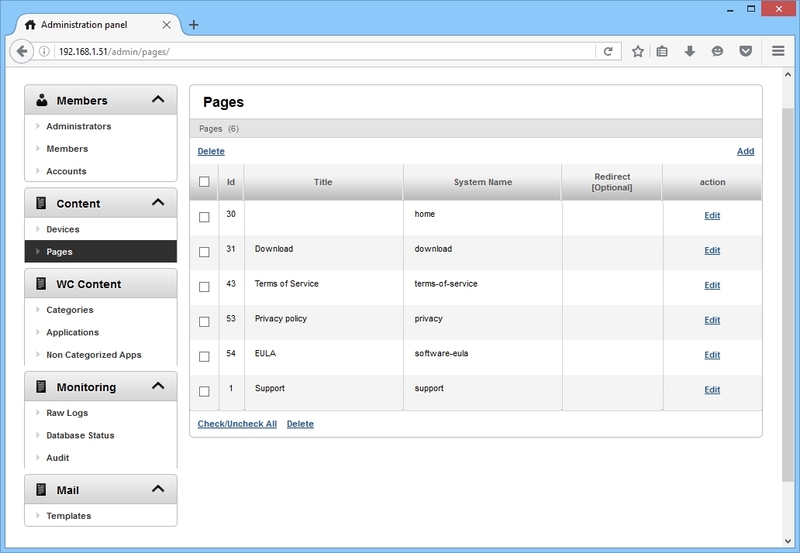 In the section Pages you can add, edit, or remove webpages on the local service without affecting its performance. After going to the required page, click Edit. 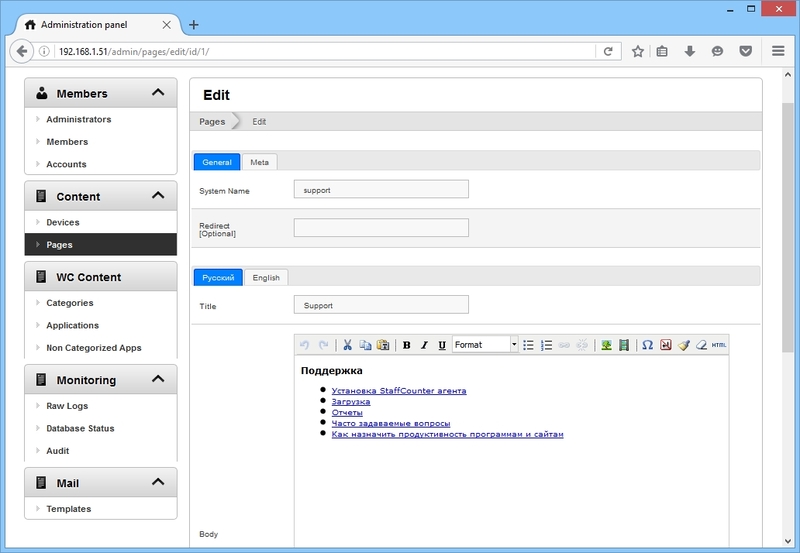 A site is made in several languages. 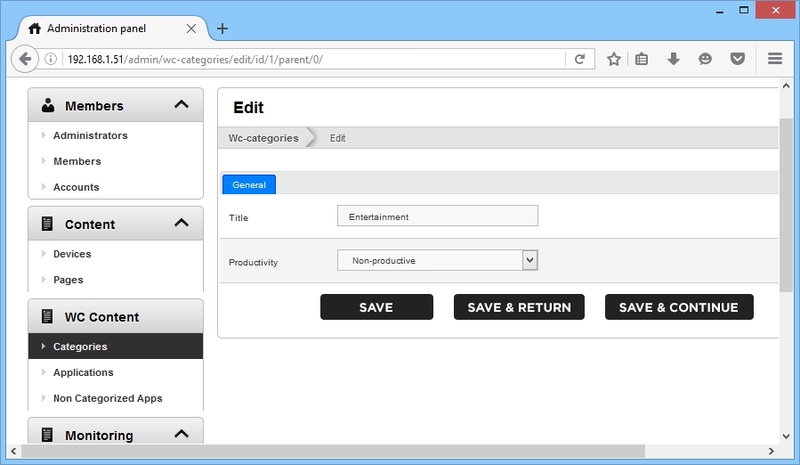 Select the required tab and user the built-in editor. 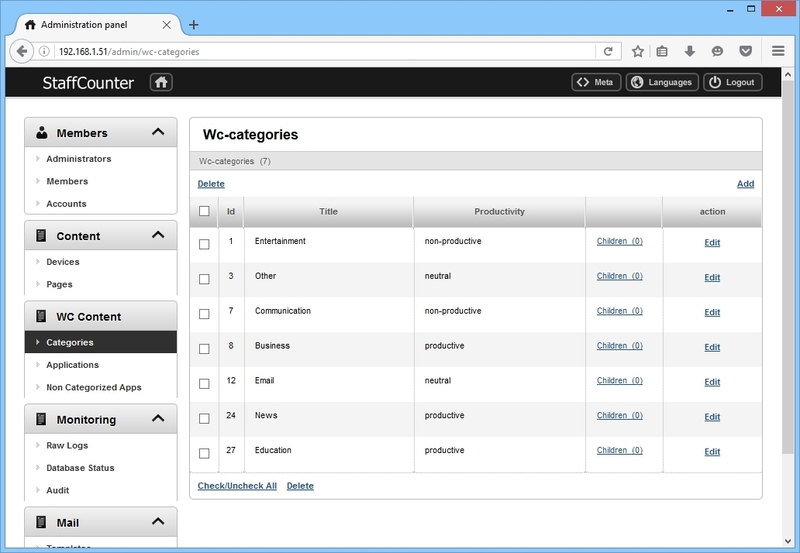 In the section Categories you can add, edit, and delete categories of applications and websites. After going to the required category click Edit. Specify the name and degree of productivity for that category. In the section Applications you can assign applications a default category. After going to the required application click Edit. Specify the name and category for the program or web address. 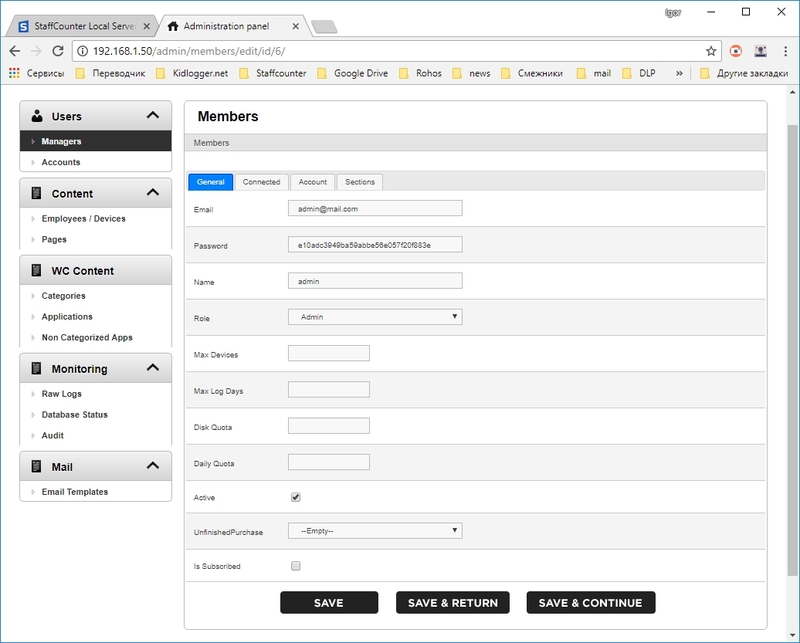 Entries in this section relate to sessions when monitoring agents connect and upload data to the server. 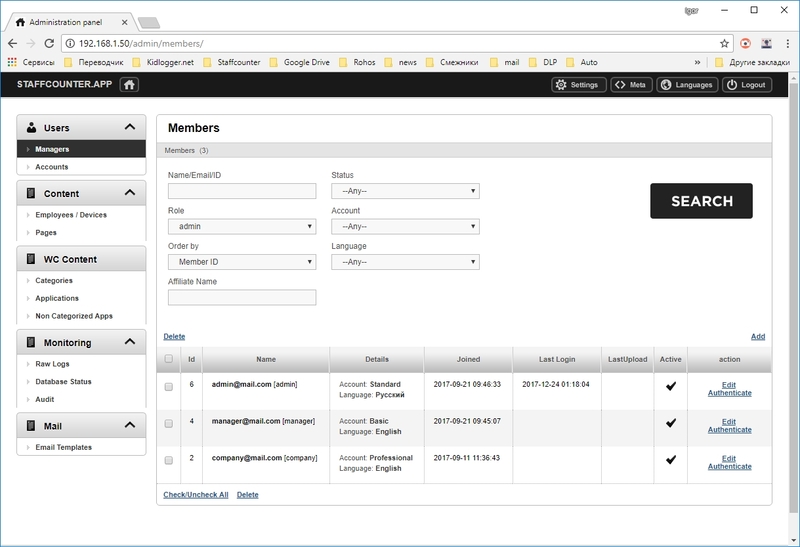 Each entry contains the client’s time, size of uploaded data, operating system version, agent version, and the virtual device ID. 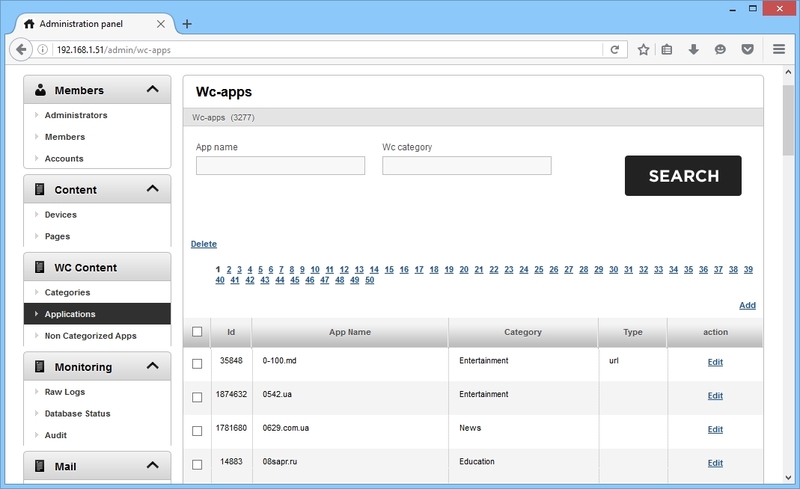 This section allows you to see the amount of entries in each database table. 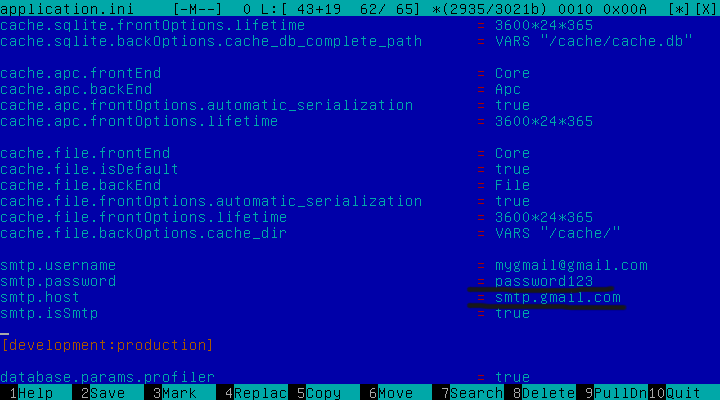 Using this information you can trace errors in server operation. 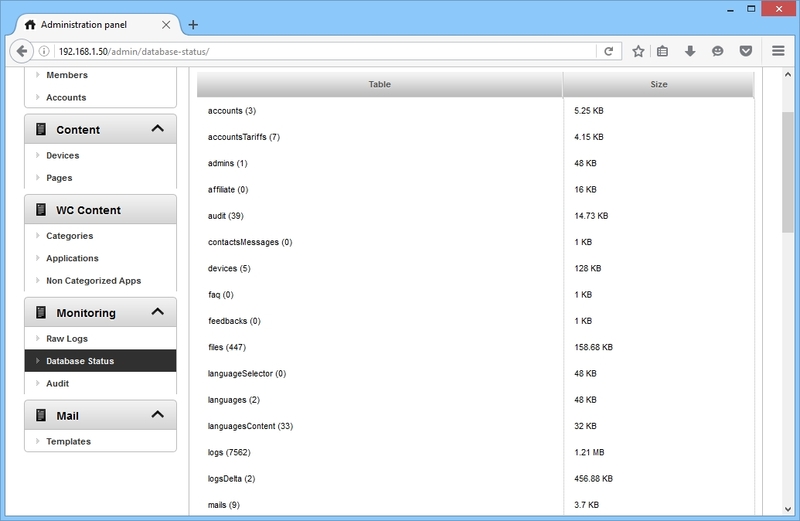 In this window you can track the activities of site administrators when working with user accounts. Instead of 192.168.1.51 specify the network address of your local server. Use the username and password from the Readme file. To send reports and notifications, the local server should use an existing e-mail address. You must create or use an existing e-mail address and enter the username and password for it into the server’s configuration file. Launch the virtual machine, enter the user account using the username and password provided in the file readme. Find the file /var/www/client/.env. and open it for editing. At the end of the file enter your e-mail address and password. Important: In the Gmail account settings allow the use of programs with a low level of protection. Save the file and restart the server(sudo reboot). To check the connection create a report and click on twitter icon.